Developed first for the Bennelong SwissWellness Continental Race Team, the MAAP Race Mitts are designed to excel at all levels of the sport offering premium comfort, protection and control while training and racing. A 4-way stretch top fabric combined with a durable microsuede fabric for the palm enables these race mitts to mould to your hands for a smooth on the bike feel. 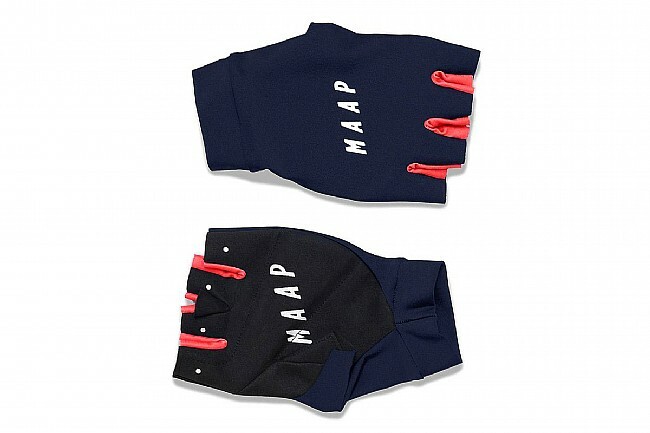 The MAAP Race Mitts are lightweight, breathable and deeply performance-driven in design. A breathable and moisture-wicking 4-way stretch fabric with antimicrobial properties offers great ventilation and quick-dry capabilities. The microsuede on the palm with subtle mid-palm padding is supple yet durable for added comfort as well as protection. A pull-tab in the middle finger makes it easy to slide the gloves off at the cafe or end of the ride.